Invented in the late 18th century, stroopwafels are the most popular bakery product in the Netherlands. A stroopwafel is a waffle made from two thin layers of baked dough with a caramel syrup filling in the middle. Thanks to the Daelmans family bakery, everyone in the USA can enjoy this delicious treat which is best served with coffee or tea! The stroopwafels are also perfect for gift giving! The Variety Tower features stroopwafels in caramel, honey and chocolate flavors which come beautifully wrapped in a colorful hextower and are best enjoyed with family and friends! For anyone with a sweet tooth, Unna Bakery Cookies make the perfect gift! Created from a family owned recipe, these traditional Swedish cookies are made with the finest quality ingredients. These delicious cookies are filled with real butter and all-natural, non-GMO ingredients and are best enjoyed with a cup of coffee or tea. With over six varieties of cookies to choose from, you are sure to find the perfect flavor for everyone on your list! Caramel Pumpkin Spice and Dark Chocolate Caramel. The popcorn is handcrafted which means that it is made one small tasty batch at a time with whole grain & Non-GMO corn. Give the gift of ALMONDS with the Blue Diamond Gourmet Almond Gift Basket! This premium give basket has a huge assortment of almonds (13 different flavors) which makes this basket perfect for gift giving. The basket features delicious savory flavors such as Pink Himalayan Salt, Black Truffle and Habanero BBQ. The basket also features sweet flavors such as Caramelized and Butter Toffee Almonds. This is the perfect gift for the true almond lover! Give the gift of the health with Comvita Manuka Honey! From the nectar of the Manuka flower in the pristine forests of New Zealand, Comvita® UMF™ Manuka Honey is as potent and alive in the jar as it is in the hive! Each batch of Manuka Honey is is tested to ensure quality, authenticity, and purity. Your loved ones can take a spoonful of Manuka Honey a day as part of their health routine, whether straight off the spoon, in smoothies, oatmeal or in tea. The honey is also perfect to add to baked goods this holiday season! Give the gift of indulgence with La Maison Du Chocolat Holiday Gift Box which includes 93 delectable pieces of fine chocolate! The collection includes a large selection of ganaches and pralinés in dark and milk chocolate, and plain dark chocolate truffles. Nicolas Cloiseau, Chef of La Maison du Chocolat, has outdone himself with this collection that draws inspiration from the magical land of the North Pole where trees, lights, gifts, elves, and delicious confections all come to life in the spirit of the Holidays! Count down the days until Christmas with the Neuhaus Winter Wonderland 3-D pop up Advent Calendar! This calendar is where the magic of Brussels awaits, one chocolate at a time! Inspired by the timeless charm and warmth of a traditional Belgian Christmas, the beautifully decorated premium Advent Calendar features a joyful selection of twenty-five full sized pralines. With every chocolate praline opened and enjoyed in this impressive box, the magical Brussels Holiday Market scene builds before your eyes, becoming more beautiful every day. This is the perfect gift for anyone that loves fine Belgian chocolate! Give the gift of healthy eating with the Cali'flour Traditional Holiday Stack Pack! Cali'flour is the first no mess, no stress, grain-free cauliflower pizza crust on the market! It's made with simple, fresh ingredients and is nut free, grain free and gluten free. The gift set features 8 traditional crusts, the Perfect Pizza Pan, a Cali'flour magnet, a Cali'flour pen, and a 5 pack of recipe cards! The crusts are 90 calories per serving, 6g of fat and 2g of carbs. This is the perfect gift for anyone that wants to eat healthy! Make your holiday gift-giving easy with Semolina's pasta-lover's gift bag! This bag features three Semolina classics: Rigatoni, Ditalini and Strozzapreti. The set also features recipes for each pasta shape, organic California-Grown whole peeled tomatoes from Bianco di Napoli and Kosher Salt from Jacobsen Salt Co. The set is ready for gifting as it comes packed in a reusable jute tote with an easy-to-clean interior! Give the gift of salt with the Hamptons Salt Company The Flavor Seeker! ​This is the perfect starter set for any cook! This set features salt representing a great cross selection of tastes which includes jars of Black Truffle, Garlic, Ghost Pepper, Smoked Hickory and Rosemary. The set comes beautifully packaged in a black gift box that is perfect for gift giving! Who doesn't love a juicy grilled steak? 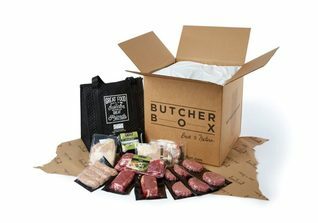 Ok maybe Vegetarians- but for those that love cooking the ButcherBox makes a unique and delicious gift! The subscription-based box sources its meats from small farms to deliver 100-percent grass-fed beef, free-range organic chicken and heritage-breed pork to food lovers everywhere! You can select a curated selection of all-natural meats straight to be sent straight to your family or friends door! You can choose from curated boxes like Mixed, Beef & Chicken and more. Each bundle will include items such as juicy ribeye steaks, mouth-watering pork chops, breakfast sausage and organic chicken breasts and thighs. Each box arrives with enough dry ice to ensure that the meat arrives fresh. This is the perfect unique gift for the holidays! Looking for the perfect gift for the fitness fanatic on your list? The Boxed Water subscription makes the perfect gift for the health conscious, sustainably minded person on your shopping list! You can choose from 3, 6 or 12 month subscriptions and the water comes neatly packaged and ready for gifting in recyclable cartons made using paper from well-managed forests. Best of all you can have the water shipped directly to your family or friends! Give the gift of hydration with Essentia Water! Essentia is a clean and smooth-tasting 9.5pH or higher alkaline water that is better at rehydrating then any other bottled water on the market - these claims are backed by solid science. Essentia is definitely the perfect gift for anyone on the go as this water will keep them hydrated and healthy! Give the gift of color with the SPIRDUST® 4 Color Bundle! SPIRDUST® is a shimmering food color specially designed for cocktails, beers, wines and other alcoholic beverages. Sprinkle a few shots of SPIRDUST® directly into your drink and stir, or add it to your cocktail and syrup bases. SPIRDUST® products are gluten free, dairy free, nut free, and vegan. SPIRDUST® is 100% edible, highly effective and perfect for holiday parties, wedding, barbecues and anywhere you need a little sparkle! With hints of coffee, roasted chest-nut and chocolate, Kahlua is the perfect liqueur with just the right sweetness for the holidays! You can drink Kahlua on the rocks or use it as a mixer to concoct delicious cocktails. This gift set comes with a 50 ml bottle of Absolut Vodka as well as a martini glass and of course a bottle of Kahlua. Make parties great again with Kahlua! Give the gift of smooth taste with Smithworks Vodka! It's the perfect vodka to use to create the perfect Holiday cocktails! This American made vodka is made with water from Lake Fort Smith and corn from Kansas, Missouri, and Oklahoma. The vodka is distilled three times and charcoal filtered for a smooth taste and clean finish. This is the perfect gift for any Vodka lover! Made in small batches and brimming with flavor, Mad March Hare Irish Poitin is a unique spirit that is so versatile it can be substituted for nearly everything from vodka to tequila and it also carries with it a storied past. Thought to be the oldest spirit in the world, Poitín has been made in Ireland as far back as the 6th century. A tumultuous history drove it underground from 1661 to 1997, when it was distilled in secret in most Irish homes. Be prepared to be seriously impressed. Mad March Hare has a shimmery appearance, a medium-weight, velvety textured body and a glorious bouquet saturated with the aromas of citrus, cocoa, anise, baked apples and barley malt. With its unique history and delicious flavor, Mad March Hare makes the perfect holiday gift! Give the gift of Tequila with Hornitos Cristalino! This anejo tequila is gently filtered after aging to remove its color. It is very smooth and slightly sweeter then your typical tequila and is perfect to drink on the rocks to to mix to create a delicious margarita or any other cocktail. This is the perfect gift for any tequila fan! ​Give the gift of sweet and smooth tequila with Olmeca Altos Reposado! This tequila is made from 100% blue agave grown in the highlands of Jalisco, Mexico. The tequila is aged in former whiskey barrels for 6 to 8 months which makes it taste sweet and citric with notes of vanilla and wood. This is definitely a spirit worth sharing! Hornitos ​Black Barrel Tequila is the perfect gift for any Tequila lover! This premium aged Anejo spends four months in deep charred oak barrels to give it rich, smoky flavor and a golden amber color. It spends an additional two months in specially toasted barrels for more depth and distinct complexity. It's truly a tequila lovers dream! Make the holidays colorful with ​The Bitter Truth Violet Liqueur! This unique liqueur has a deep rich purple color reminiscent of a full moon reflected on a river in the twilight. The Bitter Truth Violet Liqueur is made from wild violet blossoms that grow in the Alps which are then added to the finest neutral spirit. It captures the delicate and elegant flavors of this fragile flower in a very impressive way. This delicious violet liqueur makes it easy to create classic cocktails as well as modern cocktails for a festive holiday! Give the gift of smooth Crown Royal Vanilla this holiday! ​To create this extraordinary blend, Crown Royal Whiskies are carefully selected by their Master Blender and infused with the rich flavor of Madagascar Bourbon Vanilla. The result is a uniquely sophisticated whisky with bold vanilla flavor and distinct smoothness. Crown Royal Vanilla is perfect on the rocks or can be used to make the perfect holiday cocktails! Give the gift of elegance with the Courvoisier XO Cognac! This cognac is masterfully blended of beautifully matured eaux de vie, aged from 11 to 25 years. It features a complexity and richness of cognac aromas. The cognac is intensely aromatic and flavourful, with a beautiful texture and aromatic bouquet. This is the perfect gift for anyone that appreciates fine cognac! Give the gift of wine with the Ruffino Riserva Ducale Chianti Classico Riserva DOCG! This complex wine is characterized by cherry and violet notes with delicate hints of tobacco, white pepper and a touch of flint. The Classico Riserva is well balanced on the palate, with velvety tannins, firm acidity, and a lingering finish of rosemary. This is the perfect gift for anyone that loves wine! With grapes sourced from selected small lots along Marlborough's coastal plains and valleys, Kim Crawford's Signature Reserve Sauvignon Blanc is made with the finest quality ingredients. The wine reveals intense, lifted aromatics of tropical fruit that lead into a range of complex flavors. The wine features distinct mineral notes accenting its rich, hefty palate which has a clean, crisp finish. This is the perfect gift for anyone that appreciates fine wine. Celebrate the holidays with Domaine Paul Buisse Touraine Sauvignon! Exotic fruits and peach aromatics lead to a bright yet powerful palate that is fruit forward with balanced acidity and a seamless finish. This wine is perfect to be served with appetizers, soft cheeses, salads and seafood! Using grapes that are harvested by hand, Domaine Paul Buisse Cremant de Loire NV is the perfect wine for any occasion! This wine features intense aromas which are reminiscent of brioche, with overtones of quince, lime blossom and honey that are characteristic of Chenin.​ This is an ideal apéritif wine that is also lively enough to accompany an entire meal! Celebrate the Holidays with Ruffino Prosecco! This sparkling wine is the perfect gift to celebrate any and every occasion! The wine is fragrant and bursting with fruit notes, it features aromas of apples, pears and citrus. Crisp, clean and delicate with fine bubbles on the palate, Ruffino Prosecco has intense flavors of apples and peaches lead to a pleasant finish with lingering fruit and floral notes. Give the gift of choice and convenience this holiday season with Drizly! Drizly partners with local retailers to deliver beer, wine and spirits to your doorstep in one hour or less! If the item can't be delivered Drizly can ship it within 3 days! This is the best gift to give anyone who likes a variety of spirits as they can choose whatever they fancy when they want it!